The Nike LeBron 15 Low is finally set to make its debut. One of the first colorways scheduled to release comes in a “Light Bone” hue. Dressedin a Light Bone, Dark Stucco and Sail color scheme. This low-top rendition of the Nike LeBron 15 features a sock-like ankle collar with Grey tones throughout its BattleKnit constructed upper. A White midsole and Pink translucent outsole completes the design. Look for the Nike LeBron 15 Low “Light Bone” to release on March 31st at select Nike Basketball retailers. The retail price tag is set at $150 USD. 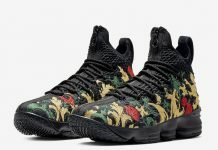 UPDATE: Nike releases official photos of the “Dark Stucco” LeBron 15 Low. UPDATE: Detailed photos of the Nike LeBron 15 Low “Dark Stucco” via shophny.